As we know diarrhea is indigestion (read: diarrheal disease), it is closely related to the food we eat. There are foods that cause diarrhea becomes severe, on the other hand there is a good makanana even recommended when diarrhea. Food for people with diarrhea the best one that is easily digestible, has a coagulating effect feces, and meet fluid needs. While diarrhea prohibition food that should be avoided is that is difficult to digest, throwing bodily fluids, and irritate the digestive tract so that worsen diarrhea. BRAT stands for Banana, Rice, Applesuace, and Toast (bananas, rice, applesauce, and toast). In addition, there are some doctors add more types of food with the acronym T and Y to be bratty, which stands Tea and Yogurt (tea and yogurt). Menu above both consumed for adults and children, but the food for infants under 12 months of diarrhea should consult with a physician. Just as important as the above, is knowing what foods should be avoided during diarrhea. Because there are certain foods that can travel through the gut very quickly and aggravate the condition, or worsen diarrhea by other means. Fatty foods. This includes fried foods and greasy foods or bersantan thick, which can make diarrhea worse. Milk, butter, ice cream, and cheese. Even if the diarrhea was not caused by lactose intolerance (difficulty processing sugar lactose, which is found in dairy products), avoid these foods during diarrhea is still ongoing. Probiotics in yogurt may be an exception to this rule. Alcohol and caffeine drinks. 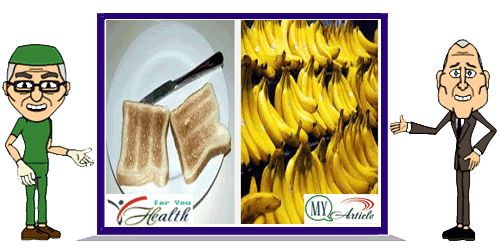 People were diarrhea, should avoid foods and beverages that cause expenditures (loss) of fluid. Alcohol and caffeine can act as a diuretic (dispose of body fluids), which means it will cause or exacerbate dehydration. Sorbitol and other artificial sweeteners. Some people find that artificial sweeteners have a laxative effect on the digestive system. If you have diarrhea or loose stools, then avoid candy and gum, diet soft drinks, and foods rich in artificial sweeteners. Foods that cause excess gas. It is very important to eat lots of fruits and vegetables every day. However, when the diarrhea, then we should avoid food choices tend to increase intestinal gas, such as cabbage or cabbage, beans, broccoli, and cauliflower, until you feel better. Also avoid anti-diarrhea drugs in the first 24 hours, because diarrhea is usually the way the body clear the infection and the bad things that need to be issued primarily to mild diarrhea, except on the recommendation of a doctor.